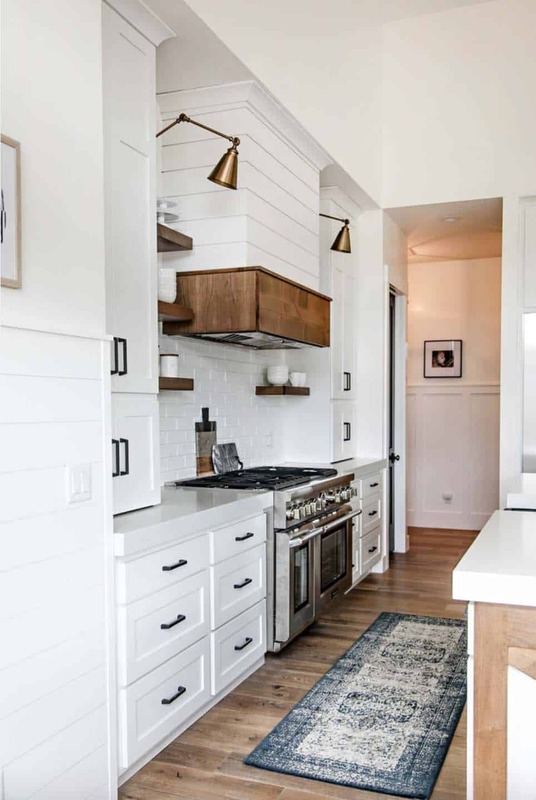 This modern farmhouse style home was designed for a family of six by Sita Montgomery Interiors, located in Mountain Green, Utah. 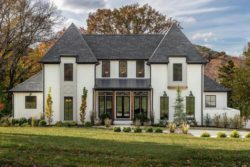 The goal for this new residence was to create bright and airy living spaces, while matching the interior to the exterior—white with black trim. 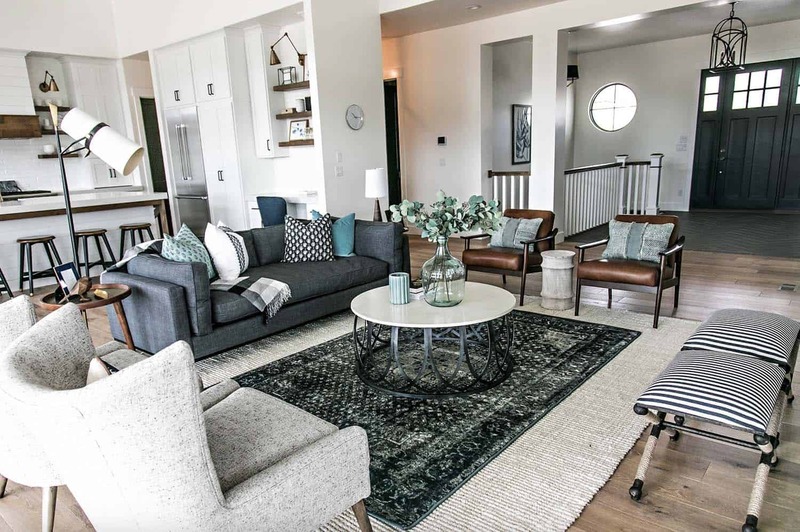 The designer wanted to create the aesthetic of an old farmhouse that had been lived in for a long time. 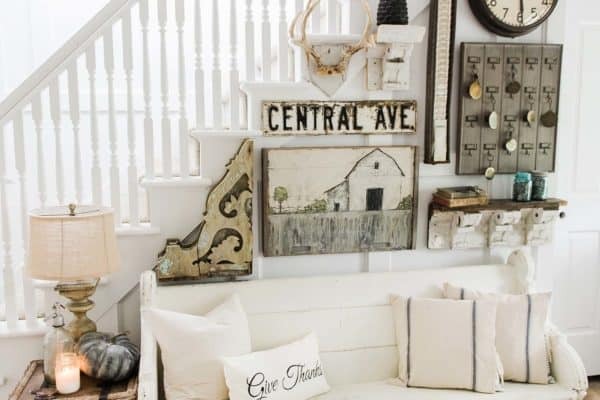 To create this aesthetic, she selected time-worn materials. 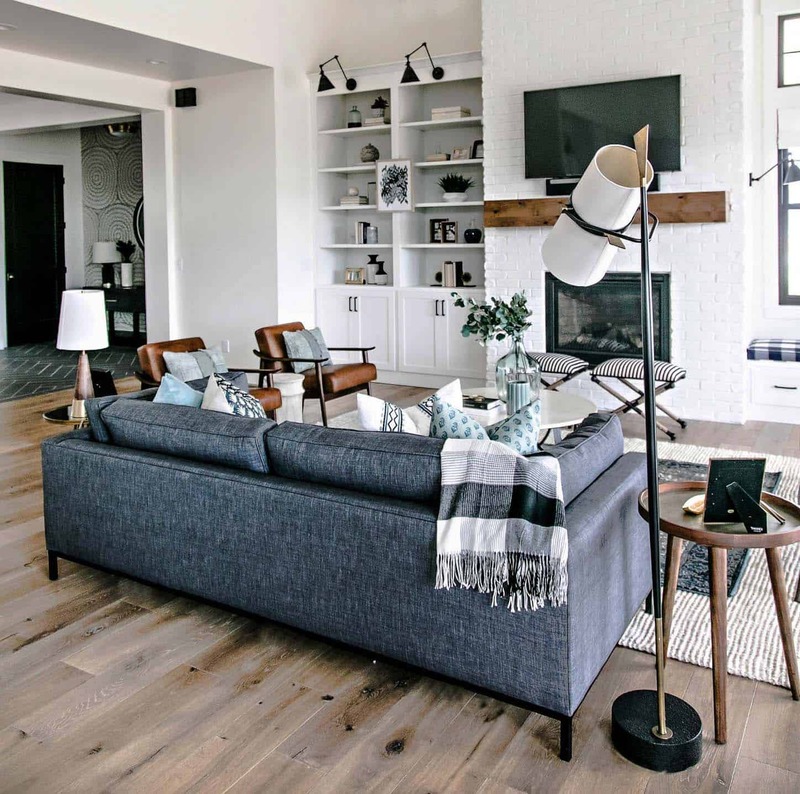 The flooring, which was sourced from Hallmark Floors, are wide-plank hardwood that has been pre-finished. 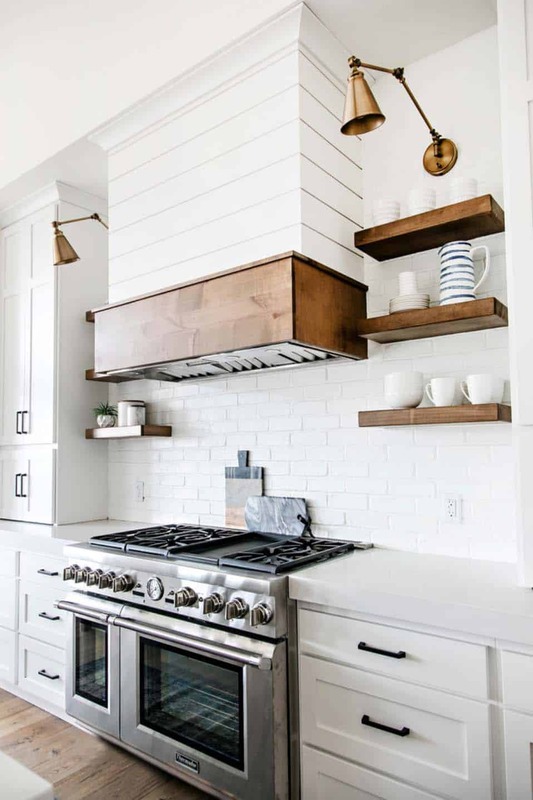 Wood accents can be seen throughout: from the fireplace mantel, to the kitchen vent hood that is flanked with the same wood used to create open shelving. 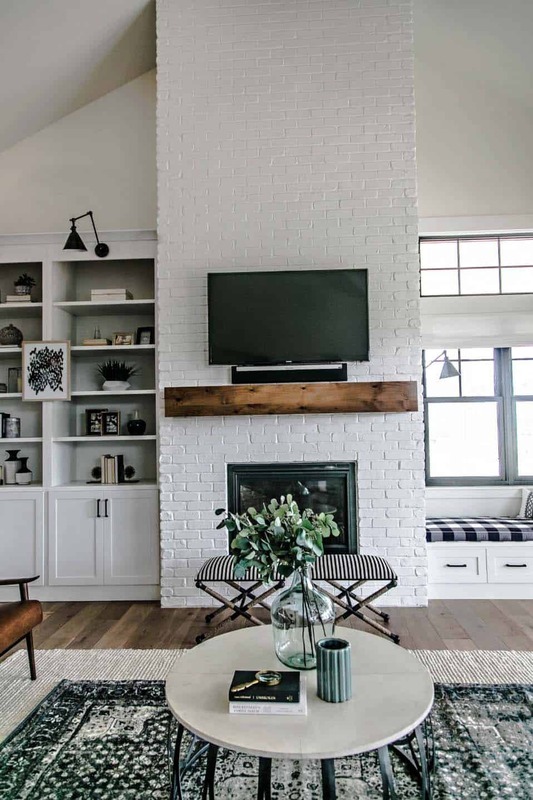 The fireplace in the living room was designed with tumbled, handmade bricks that were painted white—a nod to the past. 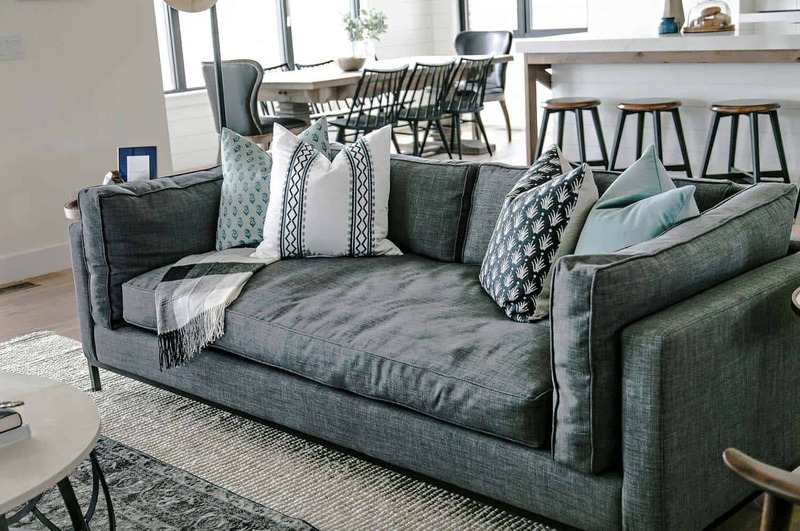 The graphite sofa was sourced from Four Hands, while the leather chairs are from one of our favorites, West Elm. 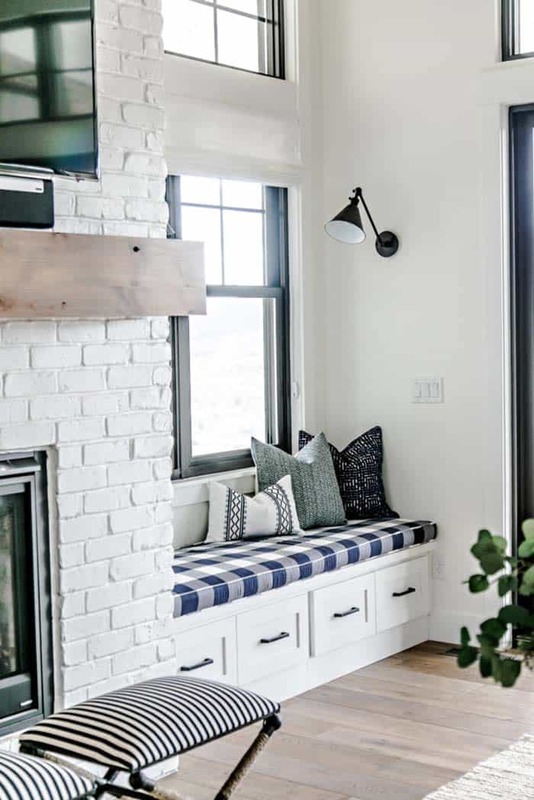 Above: To the right of the fireplace, a built-in window seat provides a cozy nook for reading. 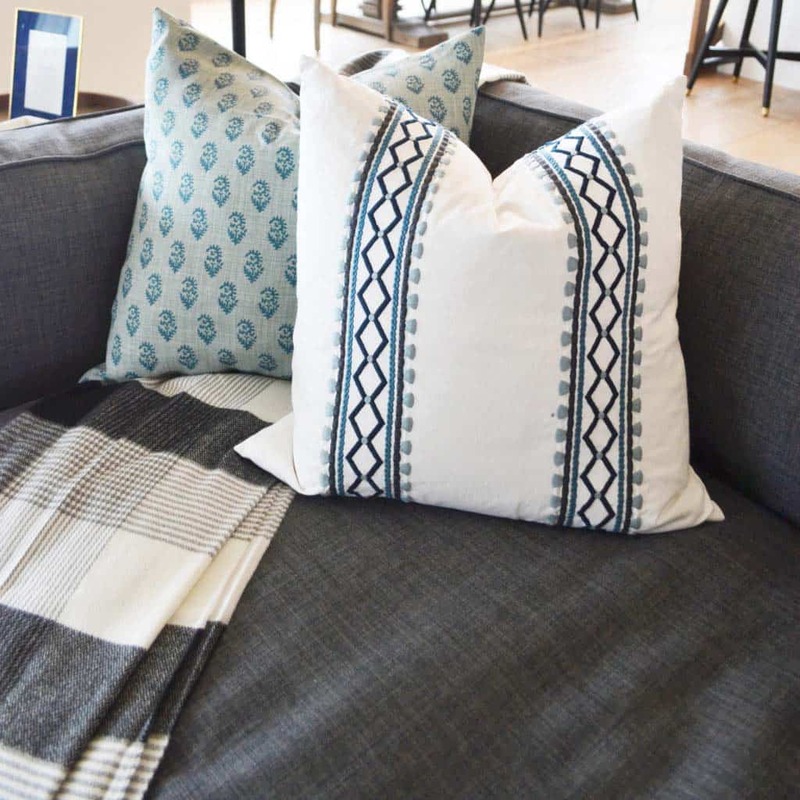 The buffalo check fabric of the seat cushion adds a farmhouse feel. Mounted above the wooden mantel is a wireless Sonos Soundbar. 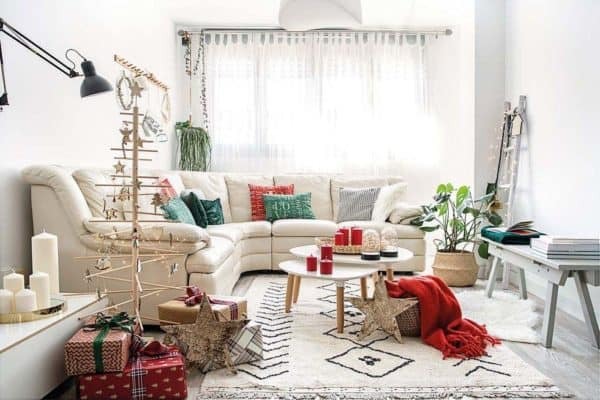 The color palette of this space is used throughout the spaces, creating harmony. 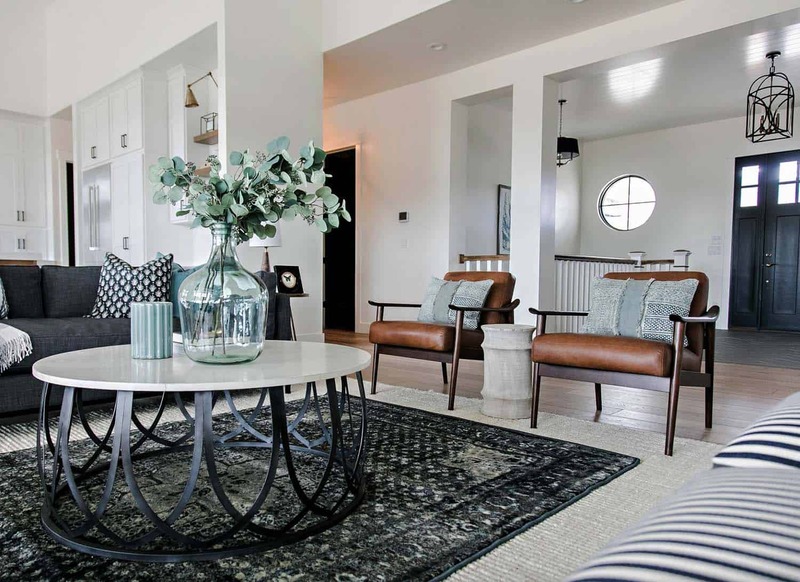 The area rug was sourced from West Elm, while the coffee table set on top is from Gabby Home. Above: The ottomans set in front of the fireplace and the table lamp are from One Kings Lane. The sconces were sourced from Visual Comfort. 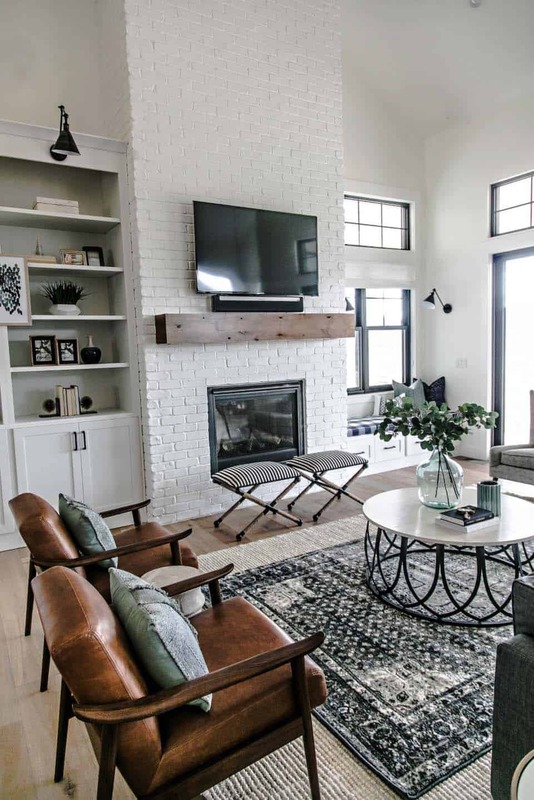 What We Love: This modern farmhouse style home features cozy and inviting living spaces with clean lines a classic color palette. 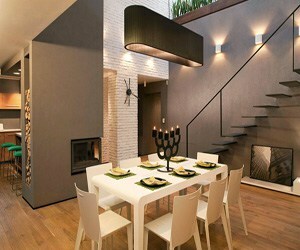 There is something very serene about this home, with the mix of colors and materials, you just feel comfortable. 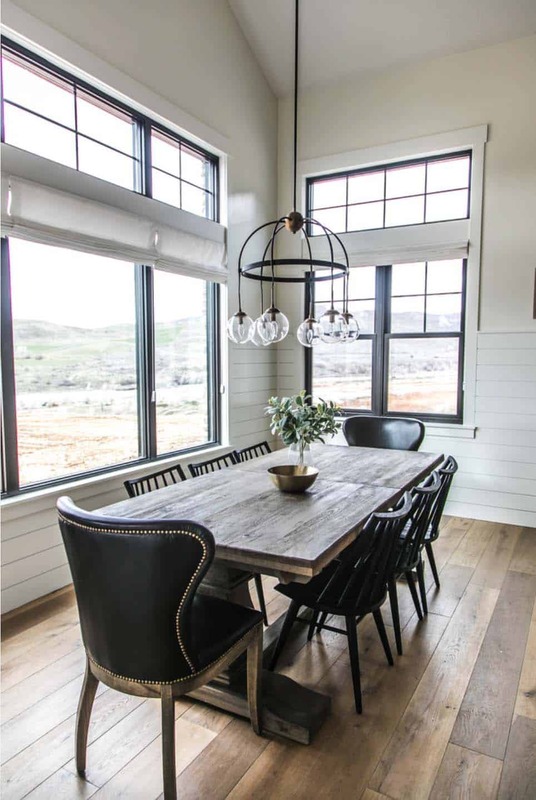 We are loving that this home is surrounded by mountains—stylish inside and fantastic views outside, can it get any better? 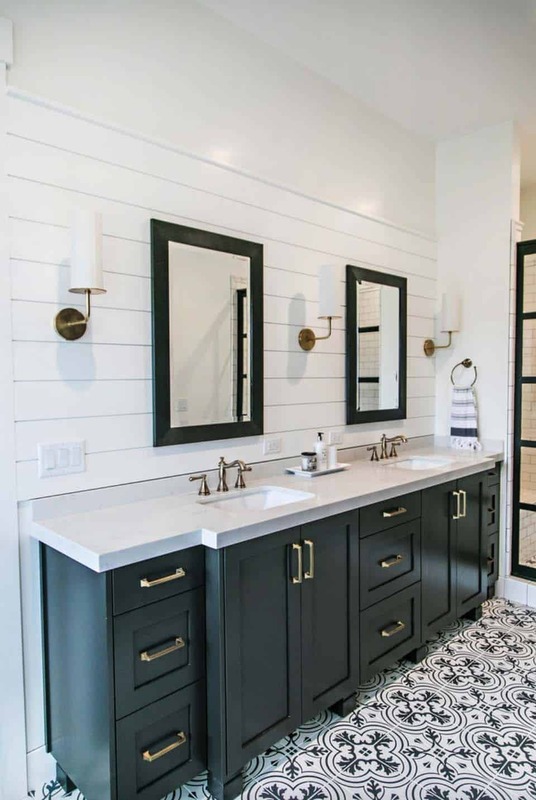 This home is very tasteful if you like the minimalist style in a home… did we mention how stunning the master bathroom is? 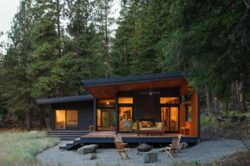 Readers, please share what you think of this home in the comments below, we love reading your feedback! Above: Since the floor plan is open concept, there was not a lot of wall space to showcase artwork. 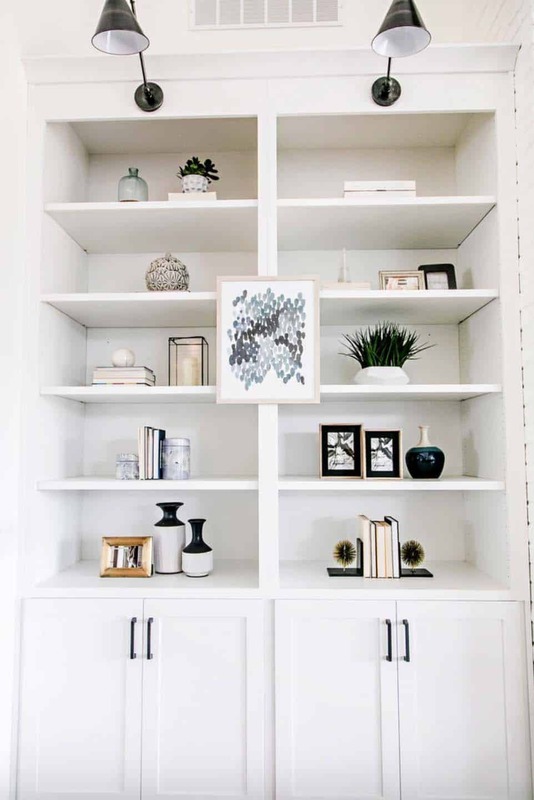 The designer selected the built-in bookcase to place a single piece of art—one of a set of three—which are displayed throughout. The art is from Target! 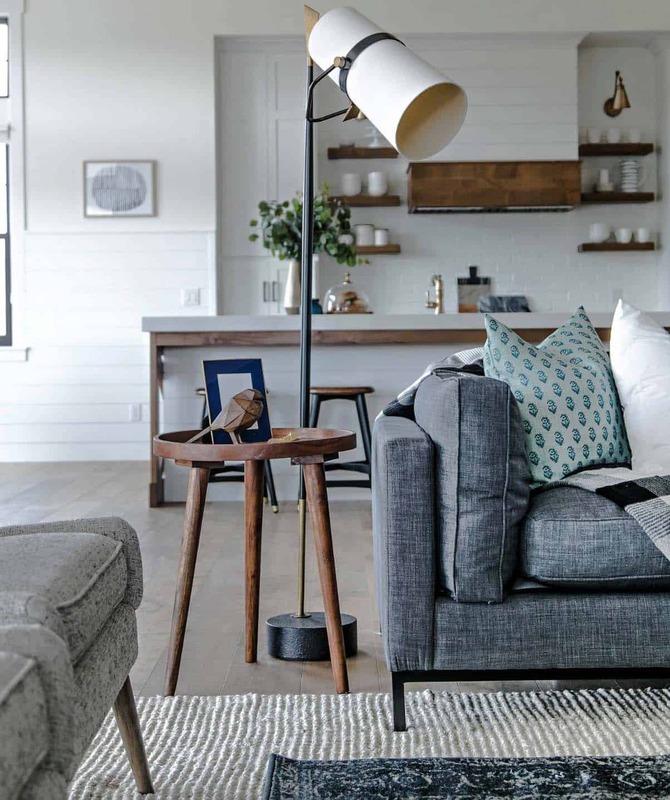 Above: On a side table next to the sofa is a wooden bird, a nod to the home’s wooded setting. 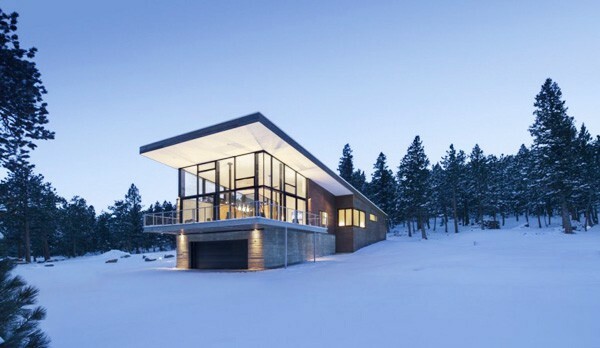 Set in the mountains, this home features incredible views. 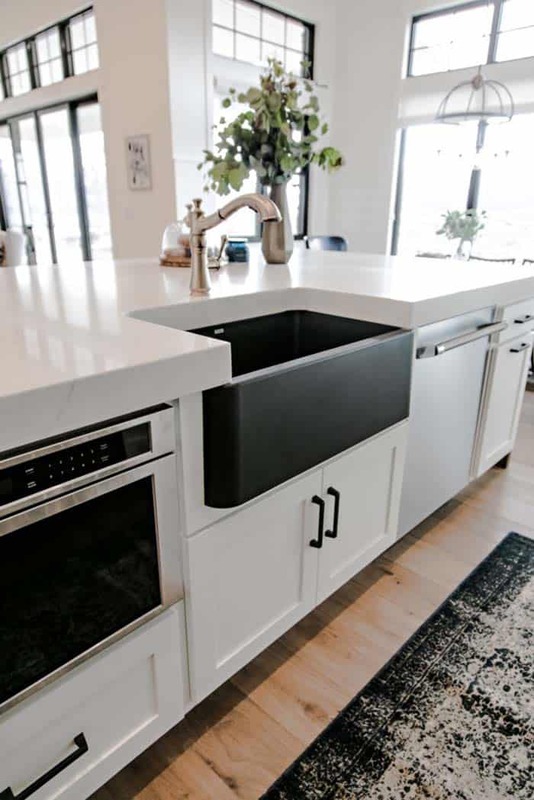 Above: The kitchen features white cabinetry topped with PentalQuartz countertops, adding a light and airy feel. To minimize reflection while adding contrast, the designer selected muted metals of iron and brass. 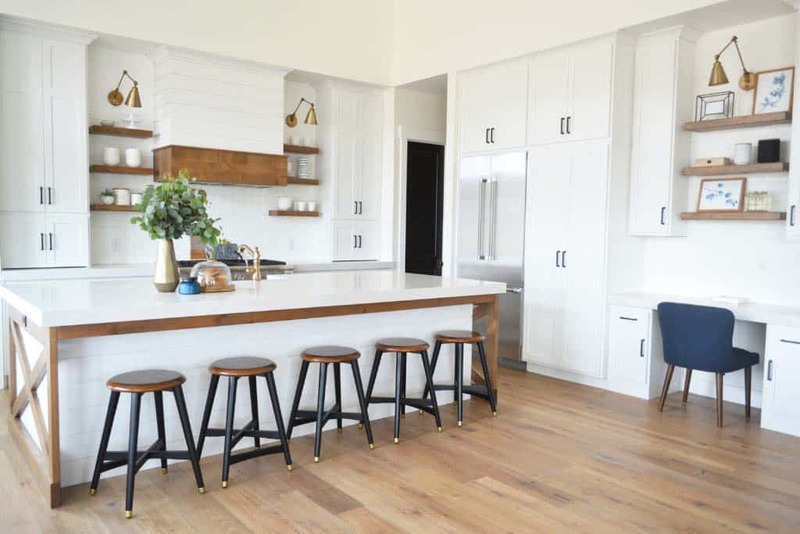 Pier 1 Imports bar stools of wood and brass adds contrast to the white island. 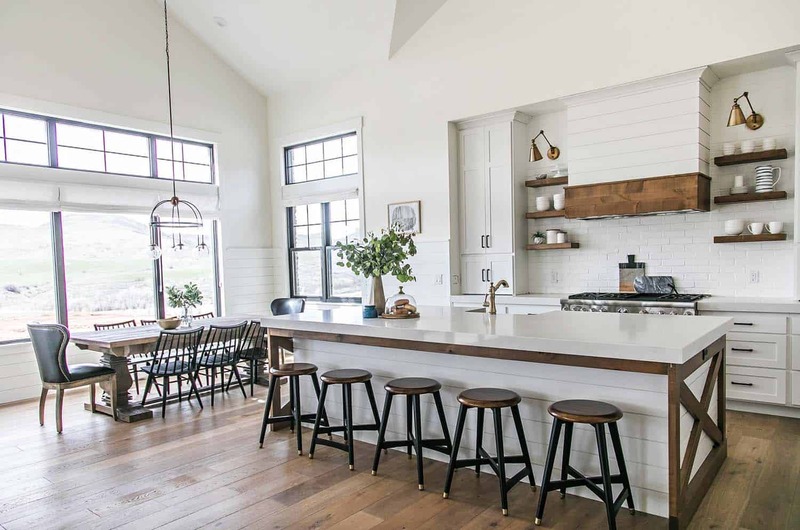 Above: Notice the barn-like X at ends of the island countertop? 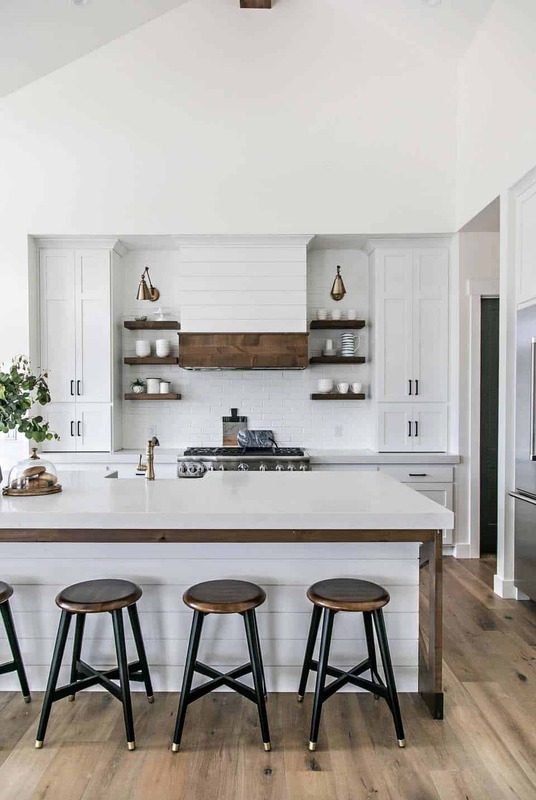 A nod to farmhouse style… and the long counter space is perfect for a large family of six. 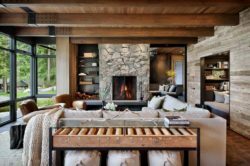 The large windows helps to illuminate this space with natural light. 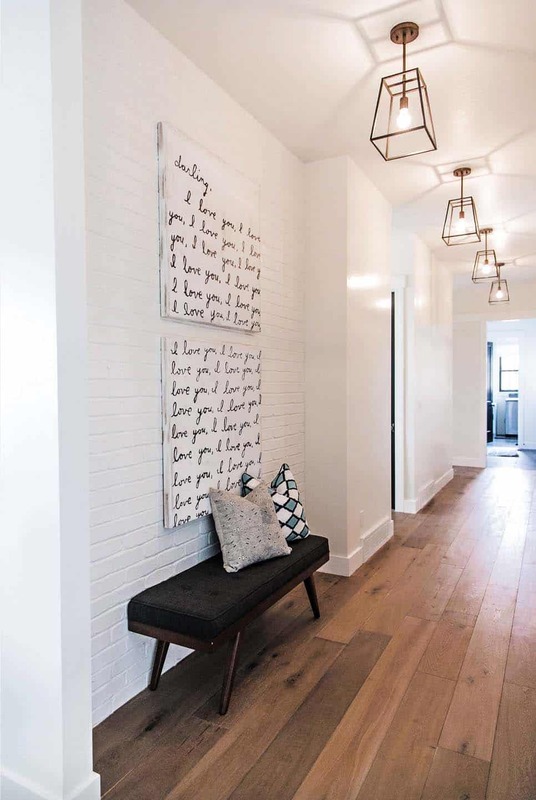 Above: A white painted brick accent wall gets repeated in the hallway, while artwork of loving messages keeps the family feeling inspired. The large ceiling pendants illuminating the hallway were sourced from Hinkley. 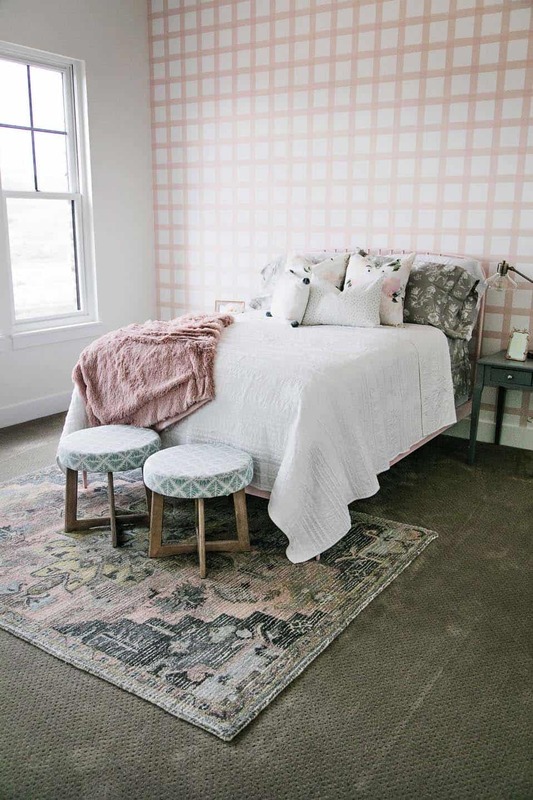 Above: The four-year-old daughter’s room features a blush pink, it is clean and bright—a space to can grow into. 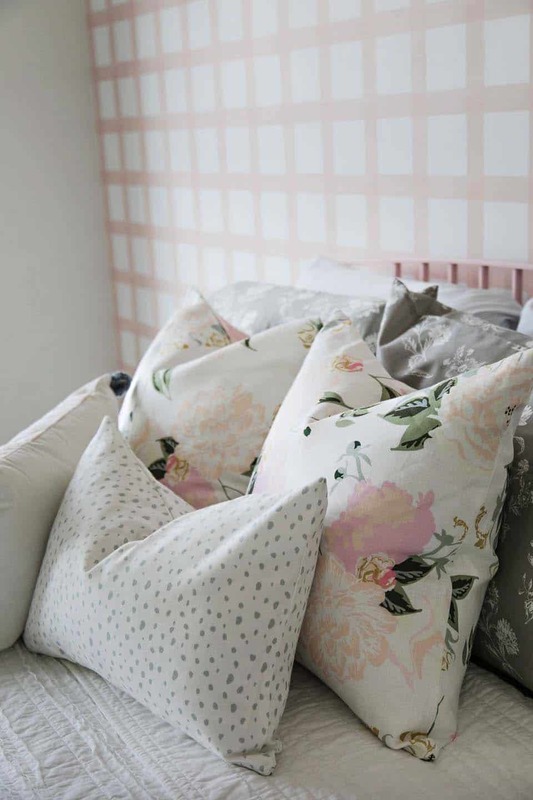 The wallcovering and pillows were sourced from Stagg Design Shop, while the metal-framed bed is from Land of Nod. The bedding and area rug were purchased at Target. 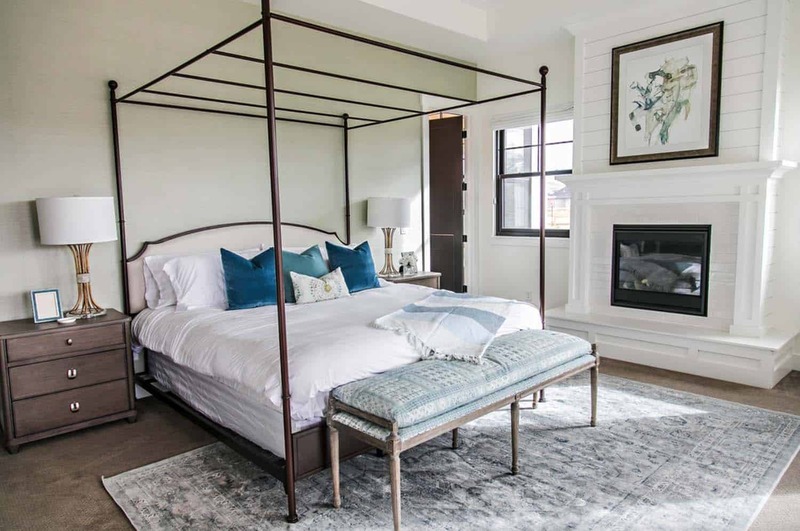 Above: The master bedroom features a dreamy canopy bed sourced from Pottery Barn, while the bench at the end of the bed is from Four Hands. 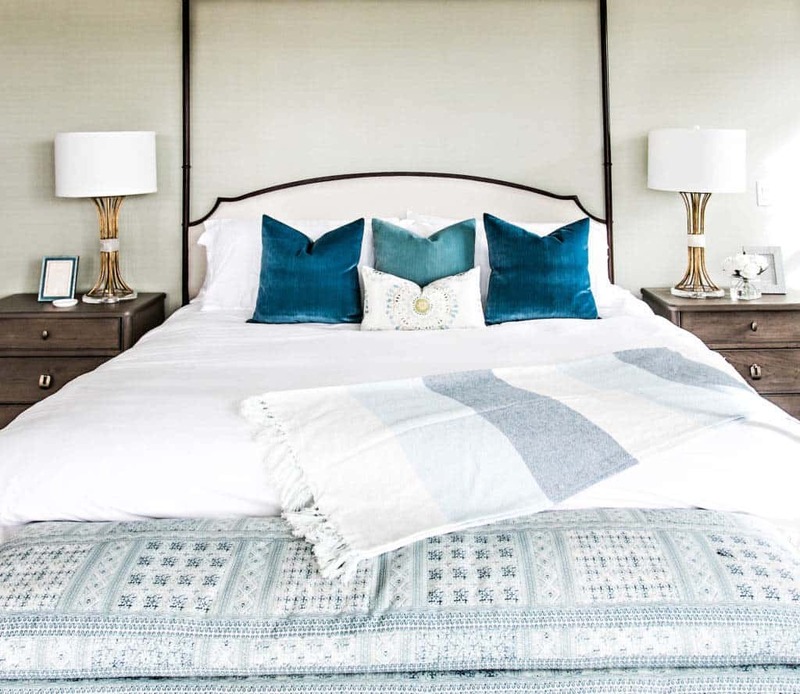 Above: The wall behind the bed is covered in a muted green grasscloth, infusing some earthy tones into the space. 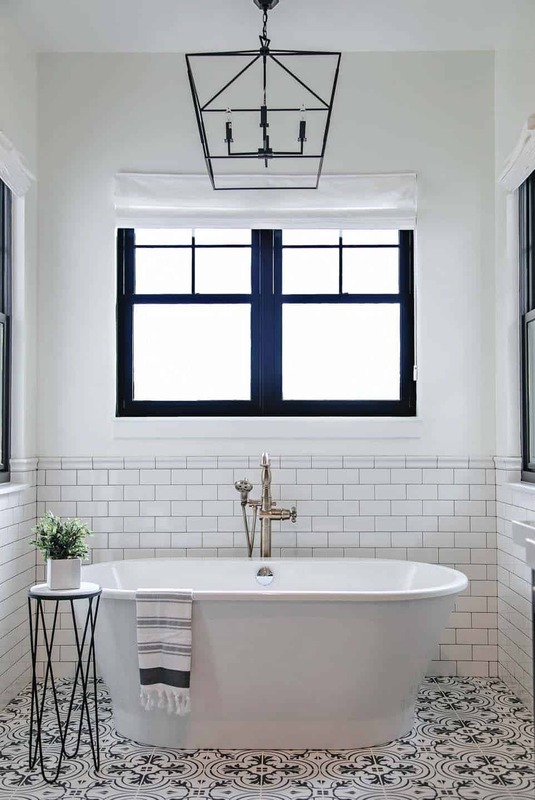 Above: This elegantly styled bathroom is dressed in black and white with brass accents. The stunning shower doors were sourced from Coastal Shower Doors—Gridscape Series. 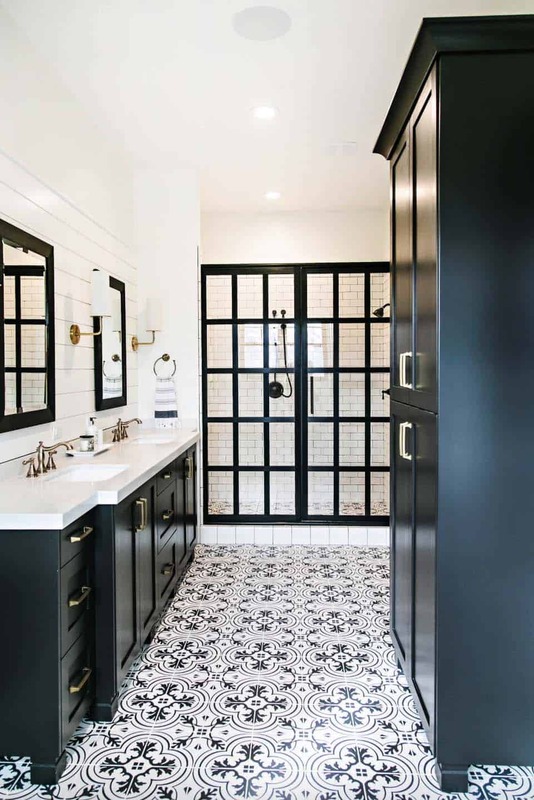 Above: The pattern tile is quite eye-catching, with a timeless aesthetic. 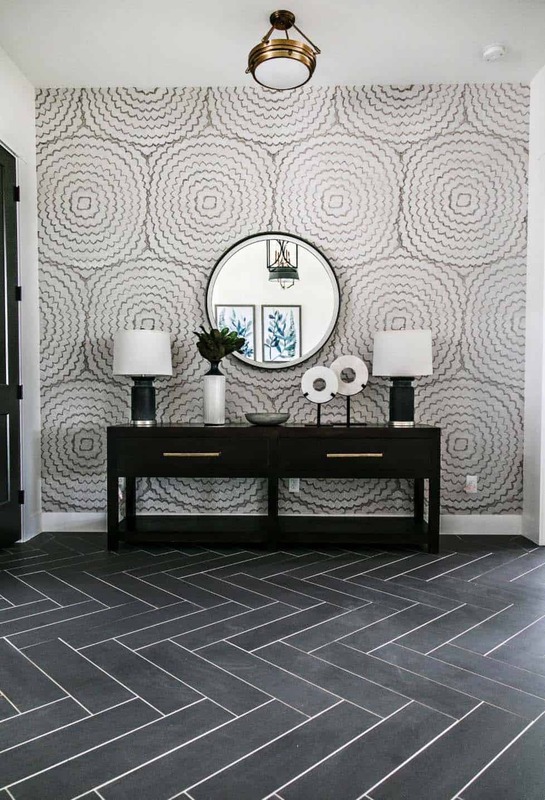 TIP: Instead of expensive cement tiles, the designer opted to save over half the cost by installing porcelain tiles with a digital print. 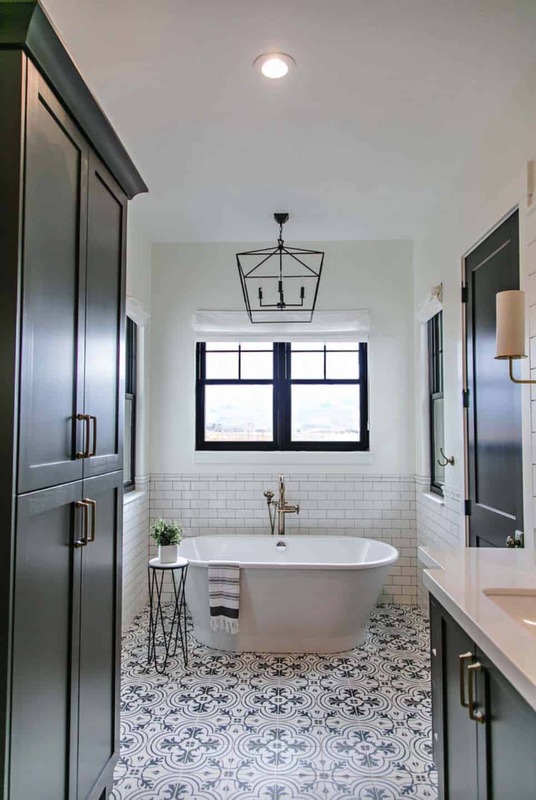 Above: The freestanding tub was sourced from Standard Plumbing, while the pendant light fixture overhead is from Gabby Home. 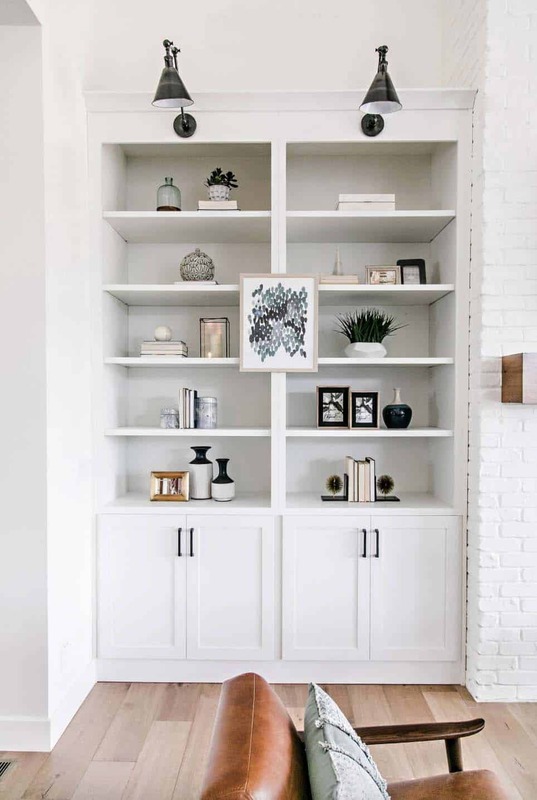 Above: The console table in the front entryway was sourced from Alder & Tweed Furniture. The ceiling light and table lamps were sourced from Hinkley. The mirror above the console table was sourced from Gabby Home. Above: The front door was painted black on both sides, creating a dramatic entry. 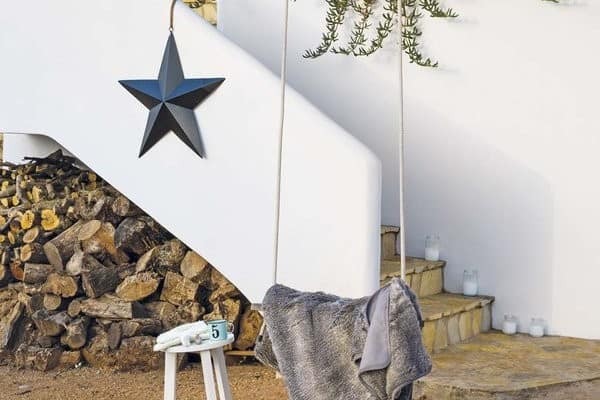 The paint color is Black Beauty 2128-10 | Benjamin Moore. The accent wall is covered in Feather Bloom wallcovering from Schumacher. 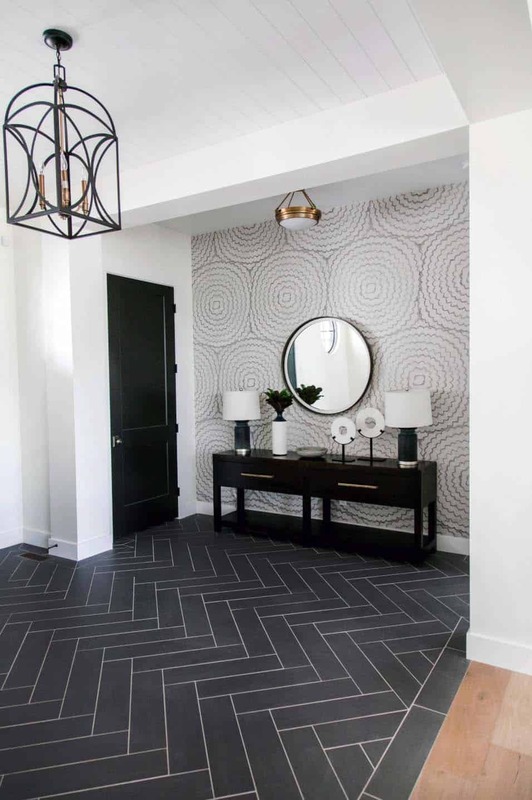 The herringbone tiling on the floor is Cebu Silver, sourced from Arizona Tile.